Although each dragonmobility chair is designed as an integrated whole, it is possible and easy for a non-technical assistant to take it apart. The seat removes by disconnecting one cable, pulling one release catch and lifting. The elevator likewise. The batteries are easily removed from under a "boot lid", once disconnected from the computer controls. No tools are required for any of these operations. You are left with five items:- the powerbase, two separate batteries, the elevator and the seat, which can be packed into the luggage space of an average hatchback car. 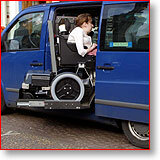 This is invaluable if you need to transport the chair in vehicles not adapted for wheelchair transport, or for air travel. It is not always possible to use public transport or an adapted vehicle, if you want to go out with friends or if your child is to be included in outings and other activities with able-bodied children. In that case helpers can be instructed how to take a dragonmobility powerchair apart and put it together again. It has been designed so that connectors cannot be wrongly assembled, and there are obvious "clunks" and "clicks" to tell you that everything is safely in place. The batteries are approved for air transport and it is easy to remove them as required for air travel or to pack into airline boxes. In the case of travelling in an estate car, it is not necessary to remove the batteries, as the powerbase can be driven up ramps, minus its seat and driver control box and with a folded elevator, by means of an attendant-drive panel on the back. Easy disassembly is not only a useful feature for transporting the chair in a car, but also allows you to deal with the unexpected and unusual situations - sometimes you have to get to an upstairs room in a historic building with no disabled access for instance. With a little help from your friends a dragonmobility powerchair can be taken apart, carried upstairs in parts and reassembled in few minutes (depending, of course, on the length of stairs and the help available). You might not do it very often - but maybe that one occasion will be really important to you. 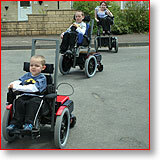 The modular nature of our powerchairs also makes life easier if there is a need to exchange any of the parts. The telephone can be used to describe and diagnose what service is required, and parts exchange can sometimes be done by courier, rather than on a service visit, with telephone or internet advice to you or an assistant on the spot. The computer control itself can be easily unscrewed and the joystick control box unplugged for exchange. Our aim is always to reduce downtime to a minimum. Taking out one of our service contracts can make sure your dragonmobility chair is serviced regularly by experts, and we hope that this will maintain the reliability you should expect, but sometimes accidents happen and emergencies arise, and we hope that our modular design will take some of the stress out of these occasional situations.